You know that amazing day when you show up at the farmers market and there are figs? I think I might have danced a little jig when I saw the green pint cartons lined up at Thistle Dew Farm’s table. There’s something so thrilling about their bourbon-plum bodies, the sticky sweet aroma. It’s hard not to wax poetic. It’s also an amazing day (for us, at least–dang, our lives are too busy) when we’re able to walk home from market and whip up a weekend brunch to enjoy on our patio. Inspired by Eileen’s Fig, Mozzarella, & Basil Sandwiches, I knew as soon as I purchased the figs that I would have to make a version of the sandwiches for either brunch or lunch. 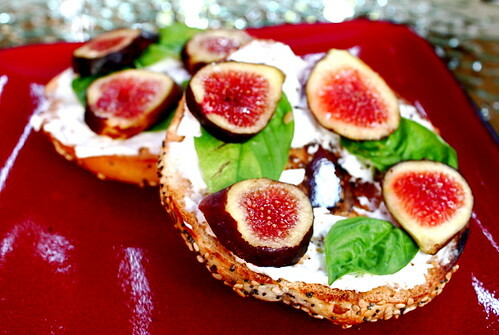 Simple and savory-sweet, these Fig & Basil Bagels hit home in so many ways. First, a toasted everything bagel from Roanoke Bagel, our local bagel store spread with Tofutti Cream Cheese. 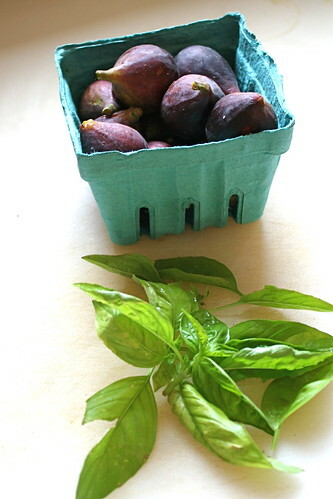 Next a few leaves of just-picked basil from the garden, then slices of figs. I don’t know how to make a brunch any simpler or more delicious. I think a less flavorful bagel (than an everything one) would have worked a little better–G suggested a salted bagel, I though maybe poppy seed or whole wheat–but the everything bagel definitely worked quite well (think: garlic). Fresh basil and fresh, local figs are a must–can’t imagine this dish working in any other season than summer–but a cashew cheese spread or other vegan cream cheese alternative would work just fine. Just be sure to enjoy with a mimosa or Irish coffee! Slice the bagel in half & toast. While the bagel is toasting, rinse the basil leaves & pat dry. Thinly slice the figs across their bodies to create rounds. Spread the vegan cream cheese on the bagel into a thick layer. Place 3-4 basil leaves on each half. 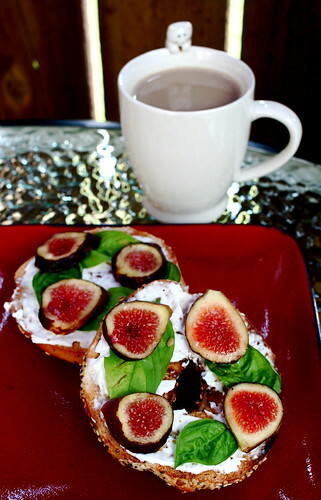 Arrange the fig slices on top of the basil. Hooray for figs! I might try a variation with goat cheese later this week (like, say, for breakfast tomorrow). Yesss, goat cheese sounds beyond perfect!!! figs!!! yes!!! those look absolutely lovely! love the flavor combo! gorgeous bagels, lady! i need to get my hands on some fresh figs asap. Beautiful! As much as I surprise myself by loving figs every year when they’re in season, I have trouble figuring out to do with them other than eat them out of hand. Basil isn’t something I would naturally pair with them, but now I can imagine it working really well. Guess I’ll just have to try it to make sure. Gorgeous! Love the inspiration. I would make it just as you did. What a GREAT idea. I have inherited a whole lot of cheese from a drunken cheese plate last weekend. I’m thinking of trying this with goats cheese on toast – no bagels, this is England, and I’m not THAT ambitious in the kitchen. The basil is inspired. Somehow I missed this post. Those figs look so wonderful and colorful. What a nice brunch. YUM!